The following is an article taken from Red Ice Creations, which is itself from a BBCNews article. We’re posting the RIC one because it gives a better, quicker description of what’s happened. No ownership is claimed over any of this article or material. Scientists in the US have created a free swimming artificial jellyfish. The team members built the replica using silicone as a base on which to grow heart muscle cells that were harvested from rats. They used an electric current to shock the Medusoid into swimming with synchronised contractions that mimic those of real jellyfish. The advance, by researchers at Caltech and Harvard University, is reported in the journal Nature Biotechnology. Because jellyfish use a muscle to pump their way through the water, the way they function – on a very basic level – is similar to that of a human heart. “I started looking at marine organisms that pump to survive,” said Kevin Kit Parker, a professor of bioengineering and applied physics at Harvard. “Then I saw a jellyfish at the New England Aquarium, and I immediately noted both similarities and differences between how the jellyfish pumps and the human heart. The work also points to a broader definition of “synthetic life” in an emerging field of science that has until now focused on replicating life’s building blocks, say the researchers. Prof Parker said he wanted to challenge the traditional view of synthetic biology which is “focused on genetic manipulations of cells”. Instead of building just a cell, he sought to “build a beast”. The two groups at Caltech and Harvard worked for years to understand the key factors that contribute to jellyfish propulsion, including the arrangement of their muscles, how their bodies contract and recoil, and how fluid dynamics helps or hinders their movements. Once these functions were well understood, the researchers began to reverse engineer them. 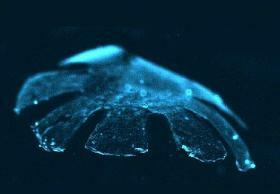 They used silicone to fashion a jellyfish-shaped body with eight arm-like appendages. Next, they printed a pattern made of protein onto the “body” that resembled the muscle architecture of the real animal. They grew the heart muscle cells on top, with the protein pattern serving as a road map for the growth and organisation of the rat tissue. This allowed them to turn the cells into a coherent swimming muscle. When the researchers set the Medusoid free in a container of electrically conducting fluid, they shocked the Medusoid into swimming with synchronised contractions. The muscle cells even started to contract a bit on their own before the electrical current was applied. The reason we’ve posted this is, mostly, out of interest. It’s fascinating that scientists are able to create an artificial jellyfish. But it’s also very, very scary. It’s scary that they would try to play god, and if they were able to succeed with this, what else are they going to try next?